PES is a realistic game. Though dribbling is fun and long shots a cool, we still need to create chances the old-fashioned way. Passing the ball around to split the defence is the style of play any team can use, and have to use. If you have a playmaker and visionary passer, that makes things easier. One of the most effective way of spliting the defence in PES is using the 3 man pass and move technique, also known as Triangular Passing. With 3 players as the 3 points of the triangles, this pass and move technique will help you split the toughest of defence. Let pictures do the talking here. Watch how Xavi (In Red Circle) starts and end this 3 man move. 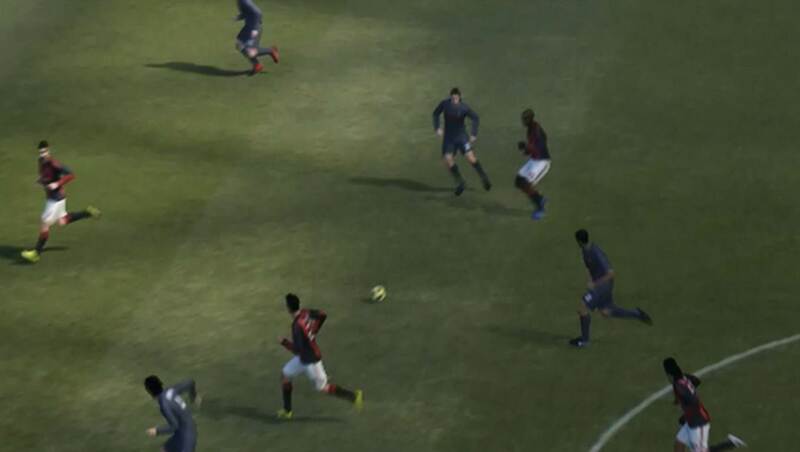 This is, in my opinion, the best passing move to split a crowded defence in PES. Try it out and drop me a feedback! And here is the video of some cool passing moves! Super jazzed about gtientg that know-how. what was that? Pls what level were u playing in? Guess I’m the worst player then. My level is Regular. I took Internacional and drew one all with Boca at Top player! A massive achievement for me, lol. I had much possesion bu couldn’t create enough goal scoring opportunities. Any help? And I have never converted a spot kick in regulation time. What a great video. And a good game too. I wish I could do pass like you. I tried hard to pass (short and through) but looks like the COM always able to intercept my ball. I play with top player. Can you tell me when I should use short pass or Through Pass? How can I make the “pressing” -I mean: to steal the ball with no tackle? It is possible to get the PES Mastery Guide without Facebook count? Can you send me one???? Thanks a lot. I hope your answer. I will use short pass when there are no teammates for me to pass to in front of me. This occurs when all our teammates are tightly marked. There is no point trying to making long forward passes, thus I will make short passes to teammates around me. I use through passes when I spot an unmarked teammates, or when I send a teammate forward with the Player Run option. If I sense a chance of making a defence splitting pass, I will try a through pass. Hope this helps! To perform double team pressing, you can hold down the Shoot button. A teammate will join you in pressuring the ball carrier. To pressure the ball carrier yourself, you can hold X instead.